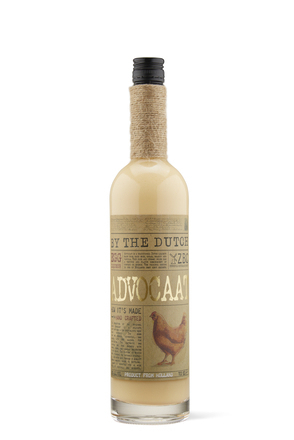 Advocaat (or Advocaatenborrel) is a traditional Dutch liqueur made from eggs, sugar and spirit (traditionally brandy but also neutral spirit), usually with vanilla and sometimes also with fruit. With an alcohol content typically 14% to 20% alc./vol., this rich, creamy drink has a texture and flavour reminiscent of custard or eggnog. Advocaat is a much underrated cocktail ingredient. The origins of advocaat are unclear but some say it is derived from an alcoholic drink that Dutch colonists made from avocado. Dutch texts from the 17th century describe a yellow-coloured drink popular with sailors of the period and made in the Dutch Antilles (Dutch Caribbean islands) from an avocado flesh mixed with alcohol. Indeed, the first know written use of the word 'avocado' was by Hans Sloane in a 1696 index of Jamaican plants. In the absence of avocado back home in Holland, they used egg yolk to imitate the colour (an obvious substitution, egg yolk for the yellow flesh of fruit?). The name of the fruit 'abacate' in Portuguese had already evolved to advocate by Portuguese colonists in Brazil, then became advocaat in Dutch. However, others, including my Oxford English Dictionary, place Advocaat's origins more recently in the 1930s with the name coming from the Dutch for 'advocate', 'being originally considered a lawyer's drink'. Whatever the origin, due to stereotyping with the Snowball, the cocktail enjoyed by British grannies in the 1970s, sadly, advocate now struggles in the UK drink style stakes. However, those that knock this thick bright yellow liqueur usually haven't tried it for years, and as for the Snowball, please try our Snowball recipe. I must profess to being a advocaat fan, Warninks is my go to brand but I also like the super-thick style sold in the Netherlands. This comes in a wide-necked bottles to facilitate its slow glug by glug pour and is traditionally served in small dishes and eaten with a spoon. 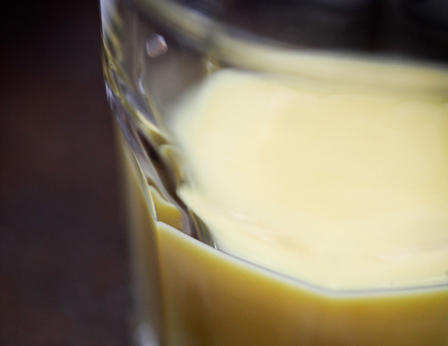 Eierlikör is the German term for what the Dutch call advocaat while the Polish equivalent, called ajerkoniak is based on vodka instead of brandy. Beach Blond - A fruity, creamy, holiday drink. Canary Flip - A delightful balance of egg, spirit and wine. Crème Anglaise Cocktail - Very reminiscent of alcoholic crème anglaise. Custard Tart - Custardy, strangely enough. Dutch Breakfast Martini - A tasty, aromatic, almost creamy alternative to a fry-up. Dutch Courage - A refreshing alternative to a traditional English lemonade. Fluffy Duck - Light, creamy and easy drinking. The gin's character prevents it from being too fluffy. New Port Codebreaker - This straw yellow drink is a most unusual mix of ingredients. Nutty Summer - This subtle, dessert style cocktail is packed with flavour. Orange Custard - A smooth creamy orangey dessert cocktail. Snowball (Difford's recipe) - creamy vanilla champagne - the ultimate Christmas cocktail. 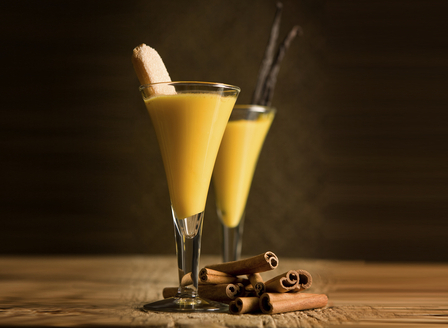 Zabaglione - Like the dessert, this is sweet and rich with flavours of egg and fortified wine.